Are you ready for a new sketch challenge, now that the kids are back to school, and the routine is starting to normalize?! I know it’s been hectic around my house, and carving out stamping time is always precious. There’s so many interesting elements in this sketch; once I decided which set I wanted to use, I had a blast putting it together! 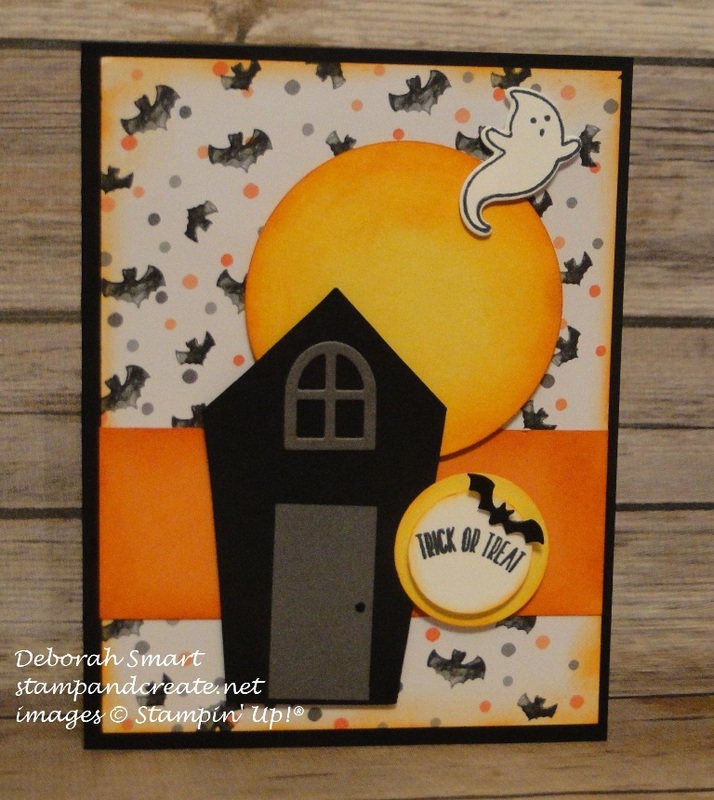 I know that Hallowe’en is still almost 2 months away, but I couldn’t resist using these 2 products; the Sweet Home stamp set and the Home Sweet Home Thinlits Dies. I started out with a suitably spooky Basic Black cardstock card base. I cut a panel of the fun Hallowe’en Night Specialty DSP, and sponged the edges with a Sponge Dauber and some Pumpkin Pie ink. I cut a 2″ wide band of Pumpkin Pie cardstock, and sponged the edges of it as well, then attached them both to the card base. I created the big moon by using my 2 1/2″ Circle Punch with Daffodil Delight cardstock. I used the same Sponge Dauber and Pumpkin Pie ink to sponge heavily around the edges, then more lightly towards the centre. The house was super easy to make; I took a piece of Basic Black cardstock, and used the Home Sweet Home Thinlits Dies to cut out just the front face of the house. The window and door are in the same Thinlits pack – there are different styles of doors & windows that you can make! The bat was also die cut using the thinlits and Basic Black cardstock; the ghost was stamped in Memento Black ink onto Whisper White cardstock, and die cut with the thinlits. With a total of 22 dies in this set, it’s a terrific investment! 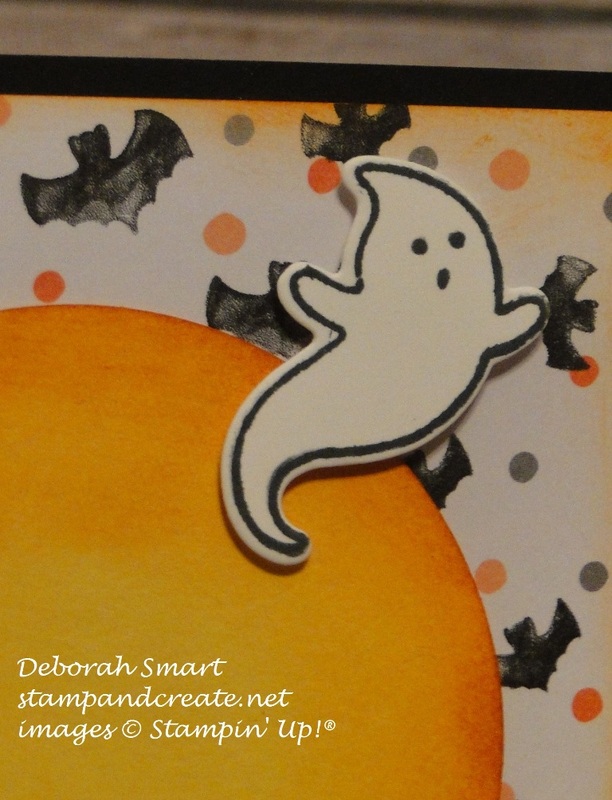 Here are some close up pictures of the ghost and the bat – I think they’re so cute! After stamping the sentiment in Memento Black ink onto Whisper White, I used the 1″ Circle Punch to punch it out, and the 1 1/4″ Circle Punch for the Daffodil Delight circle behind it. I again used the sponging technique to add some colour around the edges of both. Once everything was stamped and die cut, I assembled it all onto the card front, using Stampin’ Dimensionals and Glue Dots. I just think this is such a fun card – it makes me smile! 🙂 Let me know what you think – I’d love to read any comment you’d care to read. Now, I hope you’ll head over to the Paper Craft Crew blog, and see the fabulous cards made by the rest of the Design Team. Then, link up your own card for the challenge! You could be our next Top Pick! Thanks for visiting! 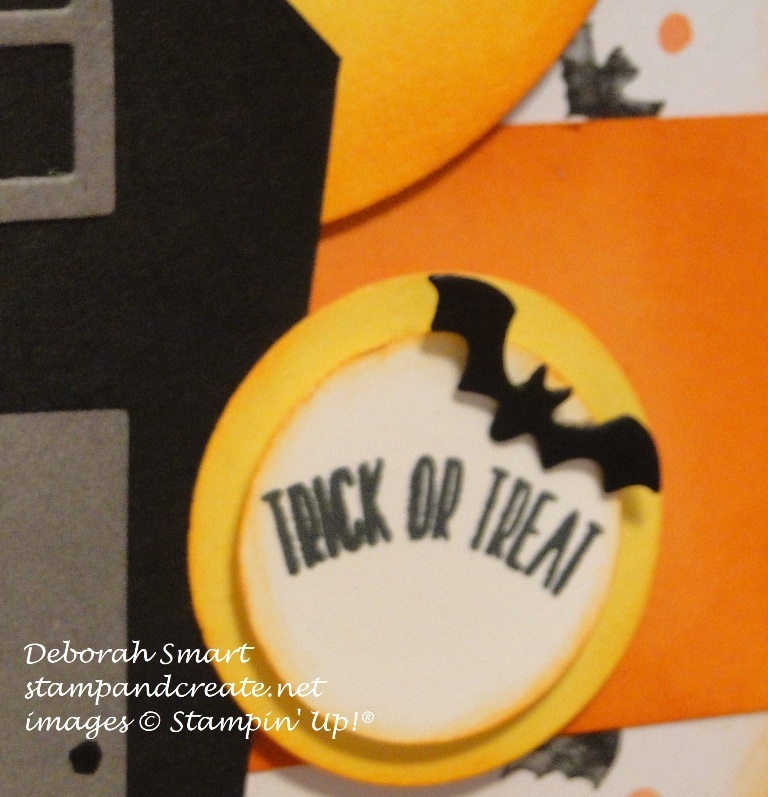 Until next time – happy stamping! Previous Previous post: Blogging Friends 1 Year ‘Blog-aversary’!